Want to write for us? Get in touch. Become a partner and feature your content here. Dagannoth Supreme is one of three Dagannoth Kings which reside in the Waterbirth Island dungeon. His primary attack style is magic, however, the other two Dagannoth Kings – Rex and Prime – use Melee and Ranged respectively. For this reason, if you’re not careful within the dungeon, you may be under threat from all three combat styles at once. There are two common tactics used at the Dagannoth Kings. If you want to be able to kill Supreme specifically, you will have to use the tribrid method in which you kill all three kings. You are not able to kill Dagannoth Supreme without also having to deal with the other Dagannoth Kings. It is however possible to solo Dagannoth Rex, so if you’re looking for a guide in which you can just kill one Dagannoth King at a time, you can check out our Dagannoth Rex guide here. There are a few reasons why players regularly kill the Dagannoth Kings. Each Dagannoth King has a unique best in slot ring drop – a coveted drop for ironmen. The Freminick Elite diary unlocks the ability to acquire all Dagannoth King bones as noted, which increases the profitability of the DKs substantially. Slayer tasks of Dagannoths are quite common and high-level players will often do the task at DKs for the high profits. Dagannoth Kings are a fun, profitable group activity for friends and clans alike. Waterbirth Dungeon Notes – In order to get through the first section of the Waterbirth Dungeon, there is a stone door which requires two players to stand on two separate triggers. If you are alone, you can use a ‘pet rock’ instead of a second player – which can be acquired from The Fremennik Trials quest. The next section of the Waterbirth Dungeon requires you to use the special attack of a Rune thrownaxe. 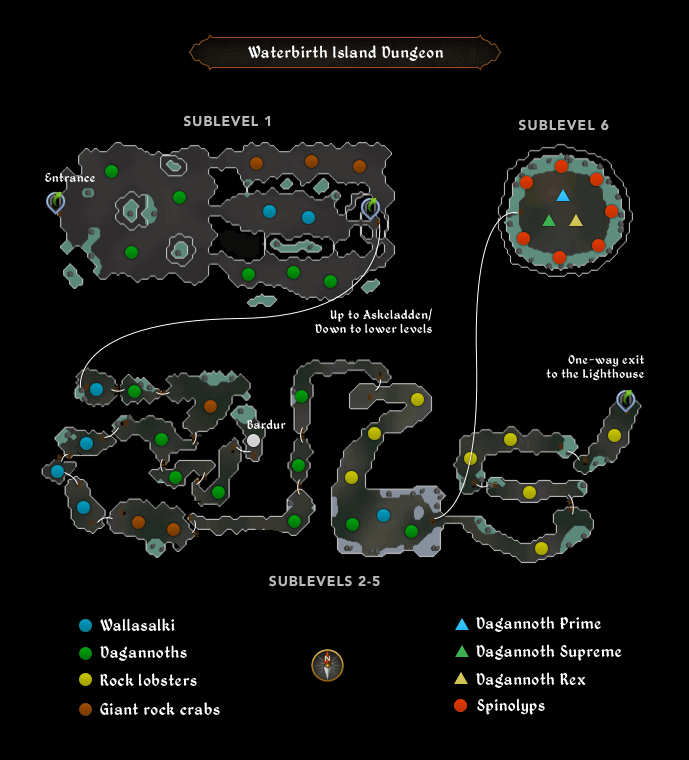 The rest of the Waterbirth Island dungeon and the route to the Dagannoth Kings can be treacherous if you don’t plan ahead. You can view a full map of the dungeon here. The Tribrid method at Dagannoth Kings requires you to utilize all three corners of the combat triangle to kill each of the kings individually. Dagannoth Supreme – attacks with magic and should be killed using Ranged attacks. Dagannoth Rex – attacks with melee and should be killed using Magic attacks. Dagannoth Prime – attacks with ranged and should be killed using Melee attacks. We have swapped out our database of items for the new, open-source osrsbox database. Due to this, some of the items below may appear missing, we’re working on fixing this as soon as possible. View your combat stats below. View your recomended inventory below. The Saradomin Godsword can be swapped out with an Abyssal Tentacle or Abyssal Whip. The Toxic Blowpipe can be swapped out with an Armadyl Crossbow, or a Rune Crossbow and Diamond Bolts (e). The Armadyl Chestplate can be swapped out with a Karil’s Leathertop. In your Rune Pouch, you can take runes for Blood spells for healing, or Ice spells for freezing Rex. Possible reasons for this: our item ID is wrong, osrsbox is down or GE Tracker is down. Report this here. We’re giving away 10 x OSRS Bonds to celebrate the launch of our new site!